Creating a new run club at my workplace is going to be a dynamic journey. My friend Jason and I have no expectations or set agenda. We are approaching this like a blank journal with no set lines to write on. With a workforce of over 700 people, we are confident that we will have a solid running group. So excited to use this simple vehicle to empower people to discover a new passion for running. Can’t wait to see where this takes us! Running is big in Ottawa. There are running clubs, the Running Room, running coaches…running is everywhere! There are also a lot of runners at EDC…so let’s have some fun and run together! 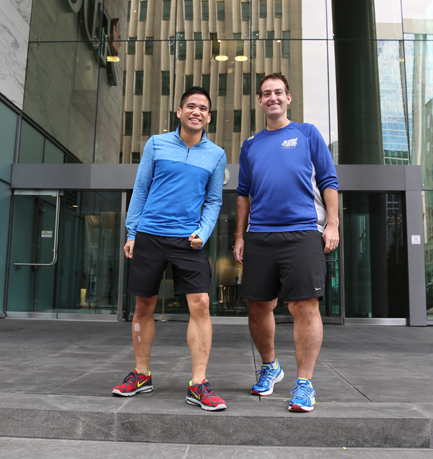 Starting November 1, Jason Roberts and Joe Rios are starting the EDC Fun-Run Club. Membership is a pair of running shoes and a half hour of your time every Thursday at 11:15! This run club is a social outing, and it’s for everyone. Go at your own pace and just run. It’s that easy. Beginners starting out, pros training for the May Race Weekend and everyone in between are all welcome! The focus is fun (with some running too). This could be the start of something big. Last month, Joe was invited to speak at CATSA’s (Canadian Air Transport Security Authority) social run club. They run as a group twice a week and they get monthly motivational speakers. Their CEO even joins them from time to time! Come on EDC, give it a try. It’s a great way to get some fresh air and meet some new people. EDC Fun-Run Club: Every Thursday, 11:15 a.m., Lobby. Be ready for fun. Jason and I ready to meet the new EDC runners! This entry was posted in Create Inspire Achieve and tagged 5km, create, dynamic, EDC, fun, no expectations, Ottawa, run, run club, running, social. Bookmark the permalink.